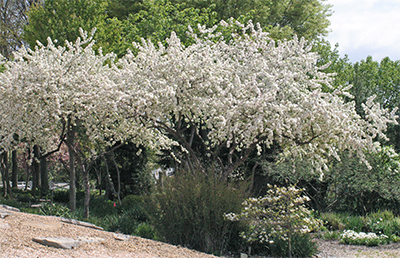 Malus 'Naragansett' in the Viette gardens this spring. Did you know that there are more than 500 different types of flowering crabapples? I thought Andre had a lot of different varieties in his garden but 500? WOW! These beautiful orange crabapples are from one of the seedlings that Alex Summers gave Andre. The birds love them! One of the main reasons why there are so many different types is that crabapples hybridize freely and easily. They tend to be cross-fertile which means that they can cross pollinate with almost any other crabapple in the vicinity. 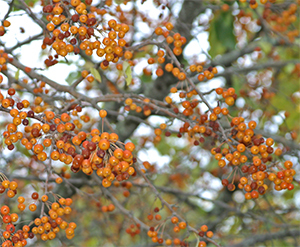 The resulting fruit is often whisked away by hungry birds which then deposit the seed elsewhere and … a new hybrid can be created. That being said, many of these seedlings/hybrids make poor candidates for the landscape because they are prone to diseases like rust, fire blight, powdery mildew, apple scab, and leaf spot. Still, there are loads of beautiful disease resistant hybrids to choose from. Andre has compiled a list of over 60 different named varieties that are his favorite disease resistant crabapples. 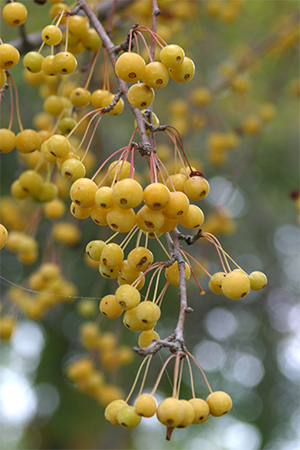 These colorful yellow crabapples brighten one the fall gardens at Viette's. 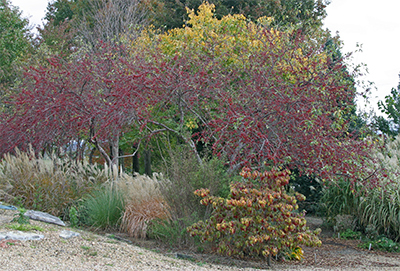 Crabapples are wonderful trees for the landscape because they have 4-season interest. In the spring, they are most amazing! A crabapple in full bloom is nearly unsurpassed in beauty by any other spring blooming tree. By carefully choosing different cultivars and hybrids, you can achieve a long season of spring bloom extending even into June. 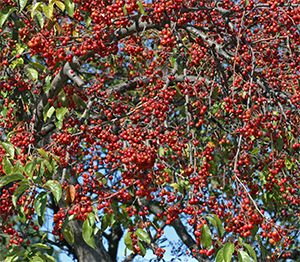 Crabapples make wonderful understory shade trees with attractive foliage through the summer season, and come fall, the brilliant autumn color comes not from foliage but from the colorful dangling fruits which stand out even more once the leaves drop; shades of red, orange, and yellow just like autumn leaves! Many of these fruits will persist into winter (if the birds don’t devour them all) adding color to the beautiful silhouette of the leafless trees. Malus 'Red Jade' is a wonderful weeping crabapple. It is gorgeous in all seasons! The crabapples are a very diverse lot as you might imagine with so many different types available. They vary in flower color (white to shades of pink to red) and timing of bloom, in fruit color (red to orange to yellow, even green) and also fruit size. Different sizes and shapes of the trees also add to the mix of traits in this diverse group. One of the added benefits of having some of these beautiful crabapples in your landscape is that the fruit provides an excellent source of food for the wild birds in the area. Many different birds will be attracted to your home including waxwings, bluebirds, wrens, robins, and mockingbirds. According to Andre, the small fruited varieties (fruit less than 3/4″) are preferred by birds. 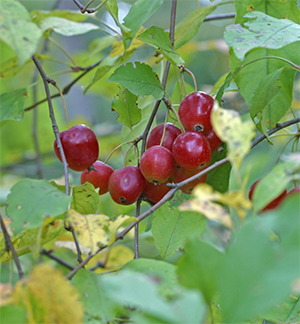 Many years ago, Andre’s dear friend and fellow plantsman, the late Alex Summers, gave him 30 small fruited crabapple seedlings specifically selected for Andre to plant in the garden for the birds. Deer and squirrels enjoy the larger crabapples! Every fall, flocks of cedar waxwings, robins, and other bird species visit the Viette gardens to feast on the bountiful crop of these beautiful crabapples. The fruit is a little hard in the beginning, but after a few freezes they shrivel a bit and soften up making them much easier for the birds to eat! The squirrels, chipmunks, and deer enjoy the larger crabapples especially after they fall from the tree. I’ve never made it myself, but I’ve been told that crabapple jelly is delicious! Malus 'Naragansett' is as colorful in the fall as it is in the spring! The oak-hickory forest has beautiful yellows and reds but the colors aren't quite as brilliant as the more northern beech-maple forests. It really is my favorite season. The air is crisp and the colors are so beautiful. Here in the Shenandoah Valley, the trees are just beginning to change. Looking up at the cooler ridge tops of the Allegheny Mountains to the west and the Blue Ridge Mountains to the east, I can see that the season is much further along up there and the trees have burst into their brilliant autumn regalia. The maples in northern New Jersey were gorgeous this past weekend! Their color is much more vibrant than our oaks in Virginia. 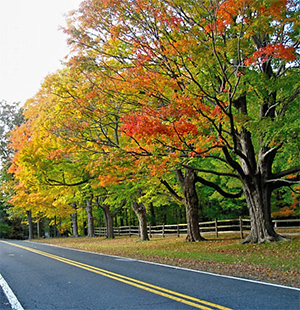 In the Valley, the oaks are developing their gold, red, and brown hues and the hickories are turning a rich yellow. 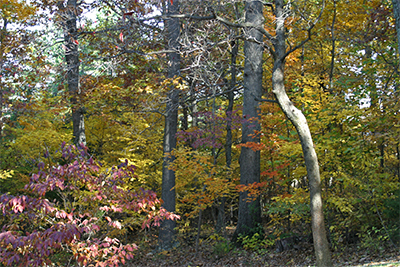 Our forest community (oak-hickory forest) is dominated by these majestic oaks and hickories but many of the understory trees and shrubs like dogwood, black gum, sourwood, and blueberry, also add vibrant color to the woods. This past weekend I made a trip up to northern New Jersey where I grew up and the fall colors were amazing! The transition from the oak-hickory dominated forest to the beech-maple forest was very apparent as I drove further north. The maples, especially the sugar maples, were ablaze with brilliant color; reds, oranges, and bright yellows. We don’t get those masses of vivid reds and oranges down here in Virginia! It was breathtaking! I love our oaks and they are beautiful in the fall but the maples really do display a much more flamboyant show. The sourwood trees are on fire in the fall! 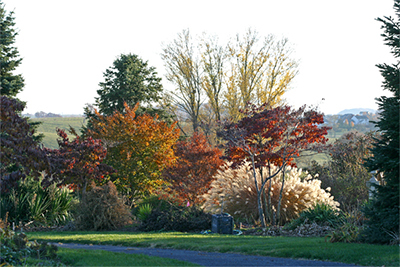 Right now, the Viette gardens are full of beautiful fall color! Sourwood (Oxydendrum arboretum) is one of my favorite trees for vibrant fall color with its fiery red leaves and contrasting straw colored seed heads. The gingko tree has donned a brilliant coat of yellow and the dogwoods and Euonymus alatus (burning bush) have begun to turn a deep shade of red. Even the hosta and many of the other perennials have begun to turn and the hardy fall mums, Helianthus, asters, and other late fall bloomers are adding additional color through flowers. Such a beautiful palette of colors throughout the garden! The crabapple trees are loaded with fruit this fall! 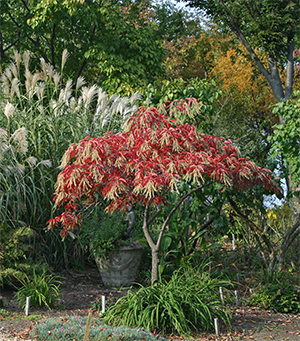 But fall color doesn’t always have to come from foliage and flowers! 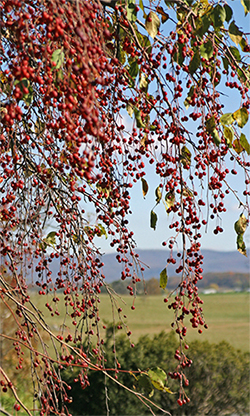 Berried trees and shrubs like the hollies (both evergreen forms and the beautiful deciduous hollies), Euonymus europaeus, Viburnum, and Callicarpa (beautyberry) all have brilliantly colored berries which persist on the plants well into winter. Right now in the garden, the crabapples are especially stunning. They seemed to have gone from leafy green to bright red (or orange) with berries almost overnight! Remember my post this past spring where Andre was going wild about the bounty of spring blooms? Well, all those flowers translated into tons of colorful fruit this fall especially on the crabapple trees. It’s amazing how many different crabapple varieties Andre has planted in the gardens. So many different sizes and colors of fruits – hmmm, that could be the inspiration for my next blog post! Next time – crabapples! Until the crabapples – Happy Gardening! A beautiful fall garden at Viette's in the late afternoon light. 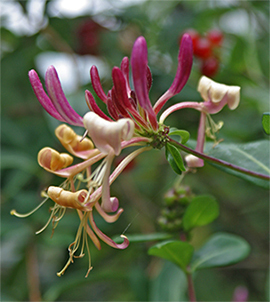 The beautiful honeysuckle flowers bring hummingbirds and butterflies to the garden. My husband really thought I was crazy when I suggested that we plant these vigorous vines to grow up the tall posts that support our deck. His mom was an avid gardener and had wonderful gardens planted around their beautiful stone home near Philadelphia. Planting honeysuckle on purpose went against every gardening lesson she had ever taught him! “But it’s really pretty and it’s a cultivated variety that isn’t invasive,” I insisted. He wasn’t convinced but he let me plant them anyway. It didn’t take long for him to change his mind! As soon as the first hummingbird came to the lightly scented flowers, he was hooked. You see, they were also avid birders! My colorful Serotina honeysuckle grows over a post at the corner of my deck. Flowers, buds, and berries decorate the vine from June to frost. 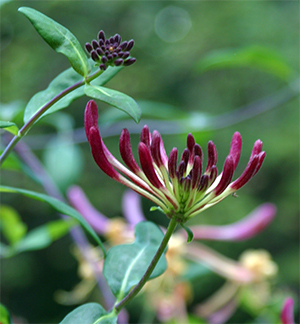 There are many beautiful species of twining honeysuckle (Lonicera) that are not invasive and make colorful accents in the garden on fences, posts, arbors, or trellises. They represent one of the few flowering vines that grow and bloom reliably in the more northern zones. These attractive vines are long blooming and most will bloom from June through August when planted in a sunny area. The one I have climbing up the posts at the corners of our deck (Lonicera periclymenum ‘Serotina’) must really like where it is because it blooms rather profusely from early June through September and will even produce flowers sporadically until the first frost! The hummingbirds love it and so do the butterflies. The only downside is that it doesn’t seem to be as fragrant as it’s supposed to be, but the constant production of beautiful flowers and subsequent bright red berries more than makes up for that. Even the flower buds are colorful! What I like most about this flowering vine is the progression of color and interest that it provides on my deck. There is a continuous succession of deep rose colored buds, delicate pink and cream flowers, and shiny, bright red fruits. All three stages of the flowering cycle are attractive and most of the time they can all be found on the vine at the same time. Spectacular! Even in the winter after the leaves fall, the straw colored stems twining up their support add interest in the garden. 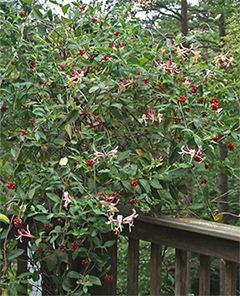 During the summer, hummingbirds and butterflies are frequent visitors to my honeysuckles. It’s really cool to relax on the deck after work and watch the hummingbirds zip from flower to flower and then off again. I wish I had some pictures to share! Maybe next year I’ll manage to get a few. It’s funny how they can’t manage to share the great profusion of flowers! They are so territorial – always chasing each other off! Bright red berries are an added bonus and the birds love them! 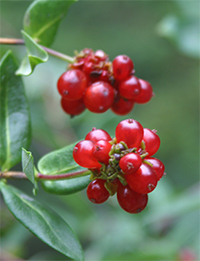 The vibrant red berries begin to appear in mid summer and make wonderful treats for the wild birds. They persist on the vines even after the leaves drop in the late fall providing a splash of bright color for us and food for the birds. In fact, in September when the flower production slows, the bright red berries really “steal the show”! So there you have it – a beautiful flowering vine that provides interest, color, and sweet treats all season long! A great plant for us gardeners AND the critters to share!